Editor's note: This article has been updated to note that Federal-Mogul, which was acquired by Tenneco Inc. last fall, is now known as the Powertrain Division of Tenneco. DETROIT — Automakers depend heavily on suppliers for the innovations that help sell vehicles. Faster acceleration, better brakes, quieter interiors, smarter controls, flashier paint, advanced safety, lighter-weight metals, improved fuel efficiency — it's often suppliers that churn those advances out of their labs and engineering centers. And hungry automakers don't care whether vehicle sales are up or down at the moment, what political party is in power, nor what Wall Street thinks about the industry's future. They just need product innovations to stay competitive and meet government regulations. But how does a major technology supplier keep up the effort in the face of its own economic challenges and internal stress? Federal-Mogul is a snap-shot of one company that has managed the feat. Federal-Mogul, which was acquired by Tenneco Inc. last fall and is now known as the Powertrain Division of Tenneco, has steered through a bankruptcy, ownership changes and the Great Recession while keeping its pipeline full of innovative products. How it did so can offer a guide to automotive suppliers bracing for an anticipated downturn. "We only had to look over our shoulder at all the competition to know that we had to keep innovating," says Keri Westbrooke, Tenneco Powertrain's director of engineering and technology. 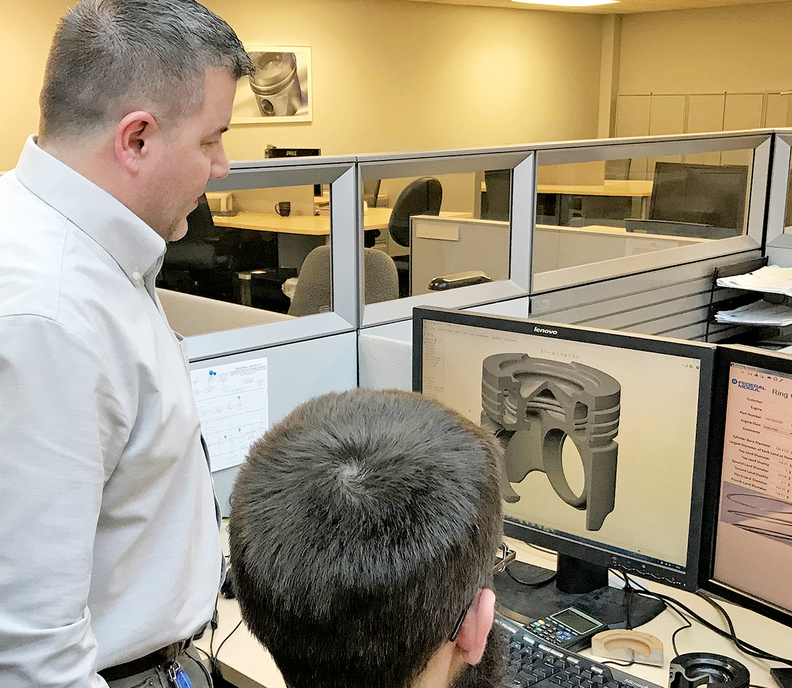 At Tenneco’s powertrain technical center in Plymouth, Mich., formerly operating as Federal-Mogul, engineers study piston designs, materials and coatings. To be sure, it was not unique in those efforts. The entire industry felt the global financial crisis that tripped up the economy 10 years ago. In 2009 alone, 27 leading original-equipment parts suppliers filed for Chapter 11 bankruptcy protection, including Lear, Metaldyne and Visteon, according to Atlanta law firm Burbage & Weddell. Federal-Mogul navigated it by fostering an r&d culture of innovation, fine-tuning its organizational structure and maintaining a diversified customer base that valued new ideas. In the mid-1990s, an acquisition spree by the suburban Detroit powertrain-components supplier brought together companies that had to be integrated into the parent. Management churn can be a distraction, causing employees to focus more on internal organization charts than on customers. In October 2001, Federal-Mogul entered Chapter 11 bankruptcy protection. The supplier didn't emerge until six years later, in December 2007 — just in time for the Great Recession. Federal-Mogul pressed on through internal and external storms to pursue innovations for automakers, even on programs with 5- to 7-year gestation periods. Federal-Mogul's focus on bringing ideas to market has earned it 16 Automotive News PACE Awards, an annual industrywide recognition of commercializing innovations. In January 2017, majority owner and onetime corporate raider Carl Icahn bought Federal-Mogul shares he didn't already own, taking the supplier private. And one year ago, in April 2018, Tenneco, of Lake Forest, Ill., bought Federal-Mogul with plans to regroup the combined operations. The deal closed in October. Through all of that, Federal-Mogul's product development never missed a beat, as shown by its history of Automotive News PACE Awards through the period. 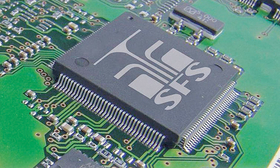 PACE Awards are given annually to suppliers for technology breakthroughs that have been commercialized, with winners selected by a panel of independent judges. Another breakthrough under the hood: The EcoTough coated piston reduced friction and lowered fuel consumption by 0.8 percent, compared to conventional pistons. Federal-Mogul won its first PACE Award in 2003. From 2006 through 2016, it won eight more PACE Awards related to pistons. In all, Federal-Mogul has tallied more than 20 PACE Award finalists and 16 wins. It has two more finalists in the 2019 competition, the 25th anniversary of the program, for which winners will be announced today, April 8, in Detroit. New powertrain components generally require at least a five- to seven-year gestation, during which an idea is conceived, vetted internally, developed, validated with the customer and put into production. That means that Federal-Mogul's PACE Award-winning innovations were for ideas that emerged or were brought to fruition while the company was in bankruptcy or slogging through the recession. 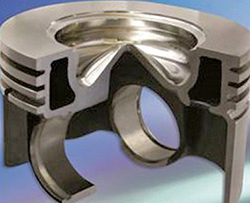 Federal-Mogul’s Monosteel piston delivered improved durability at a lower weight. 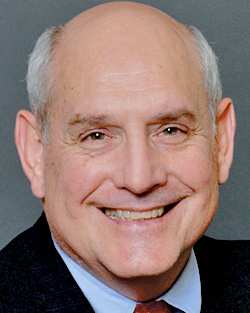 Ask Westbrooke how Federal-Mogul kept its focus on developing powertrain breakthroughs despite difficult times, and he almost seems puzzled by the question. It's like asking a happily married couple on their 50th wedding anniversary why they didn't divorce. The idea of slashing the r&d budget is alien to him. "We are a technology company," he says. "We have to keep innovating. It's our lifeblood." As far as the technology and engineering teams were concerned, he says, "Chapter 11 didn't impact us." He adds: "Were budgets depressed? Yes. Were they canceled? No. Did that make us a little smarter in choosing products and technologies to pursue? Yes. Did it stop us dead in the water? No." During the recession, some companies' CEOs may have decreed sharp cuts in budgets and head count. Not Federal-Mogul's. "That sort of math, that sort of message, never came down during the bankruptcy or the downturn," he says. "I don't think anybody lost sight of the need to keep innovations flowing." Federal-Mogul's culture includes formal processes to develop ideas. But the supplier also recognizes the importance of small teams encouraged to come up with fresh ideas, and of recognizing ideas that simply bubble up unexpectedly. Federal-Mogul uses a flow-sheet internally to illustrate how innovations go from idea to reality. It shows ideas germinating from sources it labels as "conferences," "customers" and "legislation" — but also from serendipitous encounters it calls "interns" and "cup of coffee." Rainer Jueckstock, president of Federal-Mogul Powertrain, has described that creative stage as an "adventure." Once the idea appears, it then goes through more formal "routines" where ideas are vetted and verified. Patton: Product is hot in Europe. To encourage the adventure phase, Westbrooke advises his managers: "Don't budget the last 10 percent" of r&d spending. His extensive network of labs and testing centers are often used for projects that have not even been approved or are not yet on the books. That's fine with him. Federal-Mogul's organizational structure also contains built-in safeguards for the r&d and engineering teams. The company lacks a corporate-level r&d center. At other companies, those have sometimes been a tempting target when budget-slashing becomes necessary. 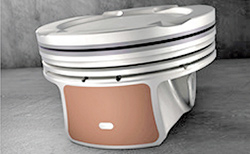 Instead, Federal-Mogul has eight product groups, such as pistons and ignition components. Each has its own technology and engineering groups, devoted solely to that product line. During the Great Recession, each product group was responsible for deciding which projects got funded. In addition, the company's diverse customer base helped when vehicle sales tanked a decade ago, according to Westbrooke. At that time, customers in the heavy-duty vehicle engine segment desperately needed help to meet stiffening emissions regulations. If a better seal could deliver a 1 percent improvement in emissions, a new piston another 1 percent and a better piston ring another 1 percent — well, the small gains added up. Those customers snatched up each innovation. Other suppliers also know the value of looking beyond the North American light-vehicle market. Magneti Marelli’s Software Flexfuel Sensor has been a huge success in Brazil, where flex-fuel vehicles went from less than 3 percent of the market before its 2003 introduction to consistently more than 80 percent. Magneti Marelli's Software Flexfuel Sensor and Tetrafuel innovations — both PACE Award winners — allowed drivers the flexibility to put any mix of gasoline and ethanol in their fuel tank. The overwhelmingly gasoline-oriented U.S. had scant enthusiasm for the technology. But in Brazil, where sugar cane-derived ethanol is common, the flex breakthrough has been a massive success. Flex-fuel vehicles there surged from less than 3 percent of the market in 2003, when the flexfuel sensor was introduced, to consistently above 80 percent. Japan's Denso Corp. knows what happens when a company takes innovation for granted. After being first to commercialize common-rail fuel injection systems for diesel engines in 1995, Denso fell behind rivals such as Bosch and Delphi in the years that followed. But in 2013, Denso raised its game, leapfrogging its global competitors with a fourth-generation system, offering better fuel economy and reduced emissions. Still, it is a technology that sells well in Europe but not for light vehicles in North America, where diesel-powered passenger cars are few, said Doug Patton, chief technical officer at Denso International America Inc.
On the other hand, North American agricultural-equipment makers, whose end users are keenly sensitive to higher diesel costs, do buy the Denso common rail system. For farmers, "it's money" in their pocket, Patton said. Ag-equipment makers "really look at the system to improve their value proposition."